Two Woking teams headed for Kent on a cold windy Sunday. Here's how they went. This was always going to be the most difficult match and Guildford 1 had already warmed up by playing Marden 1 in round 1 (wining 4-0). We started with the new formation of 2-2-2 with the players as follows, Max (LB), Joe E (RB), Ollie R (LM), Jack (RM), Dan Q (LA), Ollie H (RA), Sam B (sub). Mark and I had asked for high a work rate from the start as we had experienced too many slow starts with goals quickly conceded. Guildford passed the ball around with precision and Woking were often under pressure. That said Woking defended resolutely with the new back pair marking the Guildford attackers well. Pressure continued however and Mark and I took the call to put another boy in midfield and go back to the 2-3-1 formation. We were getting overrun in the midfield as they came forward time and time again. The defence continued to hold, some great interceptions by Joe E and goalie Haiden made some great saves. Guildford however, continued to release shots, some narrowly missing their target and some superbly saved, the best being a high shot that was heading for Haiden’s top right corner, until his left hand punched it cleanly away. We brought on a substitution and Sam came on for Ollie H on the right. We were getting some possession but our attacks were breaking down in front of the D. Despite Woking being on the backfoot most of the time, Guildford had yet to score. There was just one more minute left to hold out of the 15mins. Again Guildford, pressed forward and we were defending again in the D. A foul by a Woking player (intentional ball over the back line) was to give Guildford a chance from a short corner. The ball was pushed out well to the top of the D and their striker struck the ball cleanly and it went straight in. An unfortunate way to lose the match but deserved by Guildford. Although we lost the game the boys defended well given some players were in new positions and we had initially experimented with a new formation. They stuck at the task, and never gave up, but in the end were beaten by the better team. Straight up next were the home team’s first team. We went back to the 2-2-2 formation and started the game well. Possession was much more even and we made a number of attacks down both the left and right wings. We had a couple of short corners ourselves but were unable to score. Again the defence held well when Marden attacked, and when the turnovers came Woking picked up the pace and pressed forward. Possession was definitely in our favour but we failed to capitalise on the positions. We were perhaps unlucky not so sneak a goal given the level of possession, but shots were difficult to come by and the passing around the D wasn’t clinical enough. The match ended in a draw 0-0. Guildford 2 had topped the second group and therefore proved to be another strong opponent. Again, their passing was cleaner than ours and they shot each time once inside the D. The first goal went in after a few minutes and both the next two were similar stories. We were giving them too much space and not closing the shots down quickly enough. The Woking boys continued to the end, but with this being our 3rd match in a row and Guildford 2 having had a rest, I think we suffered a little with tiredness by the end. Thanks go to Mark Rohde for managing the team. 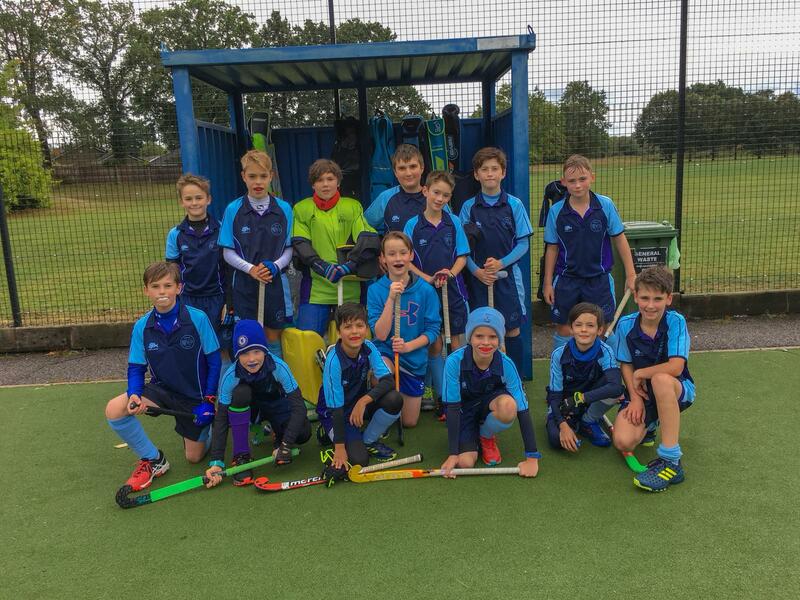 v. Guildford 2: lost 2-0. We had a slow start as usual, against Guildford who had just played a "warm up" match (I think they won 5-0 against Marden 2) and were in full swing. So we suffered a bit at the beginning and conceded an easy goal very early in the match. Then we started finding the passes and we created a couple of good occasions, but with no luck. Then we were hit on the counter with a good fast movement by Guildford which didn't give Jack any chance. This is the game when our passing wasn't so precise, and we still tried to pass the ball through the opposition (rather than around), so we gave away quite a few balls. One of the Guildford boys was hit in the face by a ball so we lost a few minutes of play... I could dare and say that if we had a bit longer then maybe we could have scored at least one goal, as we surely improved as the match went on. v. Marden 2: won 1-0. I switched Joe and Matteo to give more structure to the midfield and use Matteo's runs on the right. It was a good match, which we substantially dominated. The goal came from the right, run by Matteo, cross by Joe and then a deflection by a defender who anticipated Rory. In this match I saw some good lead runs, and good movement with the defenders (when we were attacking) and the attackers (when we were defending) filling the space in the middle zone. It was a well fought match and a deserved win. v. Marden 1: drew 0-0. Matteo was switched with Daniel and this was the best formation of the day, as Matteo and Akhil provided a good, strong back line and midfield, actually, feeding well either Gideon and Rory on the left or Daniel and Joe on the right. I think the opposition came into our D maybe once, maximum two times... whilst we had several occasions which went either wide by an inch, or were saved by the goalkeeper. Well done all on a bitterly cold day in the middle of Kent. Hope everyone's journey home wasn't too bad as I know many of us took the scenic countryside route to avoid problems on the M25. Note to Mark R, get a satnav!